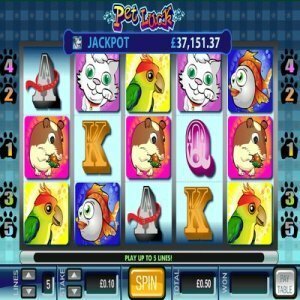 [miau] Pet Luck is a 5 Reel, 5 paylines game with funny animal themes. The game has several symbols that are pet themed. There are no wild and scatter symbols because the game doesn’t have a Bonus Round or Free spins. One of the most impressive thins with this game is the progressive jackpot. This can enable you to win big prizes. Paw prints are used as decorations behind the payline Numbers. At the top of the game, there is the logo and progressive jackpot numbers right beneath it. Pet Luck Slot has more than 27 winning combinations with various winning symbols. The win amounts for the matching symbols are normally multiplied by the stake placed per line. With 5 paylines at your disposal, you can bet one coin on each payline. The minimum line bet that you can place is $0.10 while the maximum bet line is set at $1.00. You can only have 1 coin per bet line. Players can win a maximum of $7500. It is always recommended to wager with coins at full value. This presents a risk because it could mean fewer spins before you run out of money but you may end up with a bigger prize. You can win the top jackpot by getting five fish on one payline. However, this will only happen if you have used the maximum value for the coin. The other symbol that can win you big prizes is the Parrot. With this symbol, 5000 coins are awarded if 5 Parrots are on the same payline. The majority of symbols in this game are Pet related. Pet Luck has a design to match the animal theme. You will find various types of animals on the reels. They include rabbit, Dog, Parrot, Gold Fish and Cat symbols. The Fish symbol is the most valuable symbol in this game. This is the symbol that enables players to hit the highest jackpot. The Dog symbols are used in the progressive jackpot. This is one of the most exciting features in Pet Luck slot. Winnings are paid out on the highest combination on each enabled line only. To qualify for this jackpot, you are required to stake maximum bet on each payline at $1. If you wager less than $1 per coin, you will win just a small part of the jackpot. To win the full jackpot or any particular percentage of the jackpot, you must have the winning combination. This winning combination consists of five Dog symbols in on enabled line. The size of the progressive jackpot can be quite big. Once the jackpot is won, the price will reset to a value of $10,000. This means that even the lowest value of the progressive jackpot is higher than the games top jackpot which is set at $7500. You can win huge amounts of prizes with this game especially when you play the progressive jackpot. The animal themes and pet symbols make it attractive to play. The game is easy to play because of the limited features. However, the developer should consider adding several features including Wild symbols and Bonus features like free spins. These could make the game more interesting to play and award players even more.